MESS is a new emulator with a lot of potential, and it also will emulate some ancient classic systems that no other emulator has tackled. It's nice to know that the future of Vectrex emulation doesn't hang on only one project. As of Version 0.36 beta 6, MESS has leaped to the forefront of Vectrex emulation. Anyone who cares about Vectrex emulation really needs to try both emulators as they both excel in different ways. Visit our DOS MESS page here. The DVE project began a couple of years ago with programmer Keith Wilkins and is now being continued by Chris Salomon. Chris has retired from doing major work on it, but little fixes appear every now and again. BTW, be careful downloading 2.0 anyplace other than here or the official 2.0 page. Some pages may still host older, less stable betas. everygam.zip (265k, legally distributed) All original games, including the new games and demos listed below. dve_overlays.zip (861k, distributed not-for-profit in accordance with Western Technologies' wishes) All original/older overlay sets for the DVE emulator. Look down for my original overlays and others. Visit the MESS Page for overlays for MESS. New!...Added the original overlay for Dark Tower. That overlay set can be dowloaded separately here. instruct.zip (76k) 35 Game Instruction Manuals. misc.zip (50k) Miscellaneous sound/graphics/test binary files. If I were advertising my original DVE overlays then the tag line would be something like..."Well...they're better than nothing!" They could easily be done much better but few others are doing them, so here are mine. If you are using DVE 1.40 then everything goes in one big directory. If you are using 2.0 then .PCX files go in the "pic" folder, .VOL files go in the "vol" folder, and .BIN files go in the...you guessed it..."bin" folder. NOTE: These will not work with MESS, but you can find some versions for MESS in the overlay zip file at the MESS Page. DARK TOWER (65k) These DVE overlay files by me are from a scan of the original Dark Tower overlay by Sean Kelly. MOON LANDER (83k) [preview] These overlays when used with DVE 2.0 b7 and above, with anti-aliasing off, turn the game into full color! ALL GOOD THINGS REVISION B (41k) The gradations and dithering have been dramatically reduced to get the filesizes in line. Also MESS doesn't take kindly to dithering :) Backup your current copy of agt.vol so you can always switch back. These .pcx files won't overwrite your current AGT ones. OMEGA CHASE (24Kb) Unofficial overlay files for DVE. The cartridge ships with a different overlay. UPDATED 2-5-99: If your set has my initials in red at the bottom then you ahould download this set again. 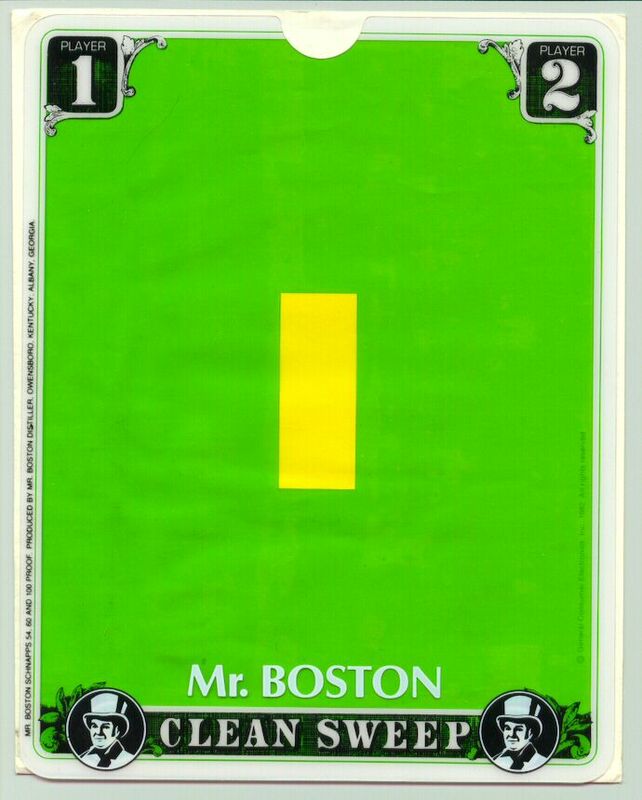 MR. BOSTON CLEAN SWEEP (47Kb) This is a reproduction of the overlays for Mr Boston Clean Sweep, a promotional (and rare) cartridge put out by a liquor company. A scan of the original overlay is here for comparison. TIP: Backup your current copy of Sweep.vol so you can always switch back. These .pcx files won't overwrite your current Clean Sweep ones. DARK TOWER (71Kb) These are original overlays by me, not authentic ones. SPIKE HOPPIN' (colored vectors) (19Kb) Before use with DVE 2.0 be sure to turn off anti-aliasing (LINE_TYPE :0 in vectrex.ini) or overlays wont look as good as they should. The same goes for the colored vector version of Star Trek. SPIKE HOPPIN' (normal vectors) (18Kb) This is a standard set of overlays done the usual way. Backup your current copy of spikesh.vol so you can always switch back. These .pcx files won't overwrite your current Spike Hoppin ones. ALL GOOD THINGS (430Kb) TIP: These PCX files are very large. You need only unzip the one you'll be using. (ex. if your emulator, in vectrex.ini, is set to use display_mode 3, then you only have to unzip agt3.pcx [as well as agt.vol]). BERZERK (IMPROVED SET) (24Kb) TIP: Backup your current copy of Berzerk.vol so you can always switch back. These .pcx files won't overwrite your current Berzerk ones. darktower_ovly.zip (34k, Stacy Davidson) These are overlays realized by Stacy Davidson. They are based on photocopies of the original Dark Tower overlay. See the overlay file above for overlays based on a high quality scan of the actual overlay. WORMHOLE (49k, Soren Krogh) [preview] These new overlays add spice to the neoclassic game from the latest Dondzila multicart. SPIKE'S WEDDING (27k, Soren Krogh) [preview] Alternate overlays for Spike, authored by a groom-to-be. These won't overwrite your current Spike .pcx files, but you should backup your current spike.vol file. SPIKE GOES SKIING (24k, Soren Krogh) [preview] This 3rd and most-polished set from Soren is for a game many would like to see someday in a finished form. Maybe the overlay set will renew work on this demo game. STAR DEMO (16k, Soren Krogh) [preview] In his second release, Soren has taken the demo for the game Star Wars (before it was renamed Star Siege) and given it the "Star Wars: A New Hope" treatment. Definitely one of the more fun overlays you'll see. MOON LANDER BETA 9 (15k, Soren Krogh) This is Soren's first overlay release. New Games How many classic systems still inspire programmers this way?